This is a course about thinking designed by Meg Tufano, one of the founders of SynaptIQ+. 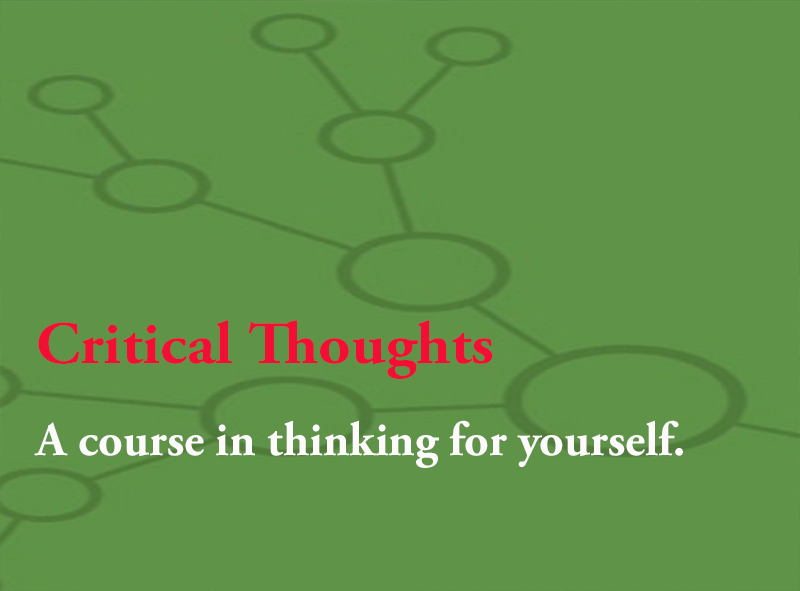 Unlike other courses you may have taken in critical thinking, this course delves into some of the major thoughts that have changed world history to discover how and why thoughts can be so powerful. We rarely think of our thoughts as powerful, but they can be so powerful they can change lives or even lead to the saving of a life or lead to the ultimate change, death. The many students who have studied thinking with Meg describe the experience as a surprising one. One of her students said, "I have been an 'A' student all of my life and I realize this is the first time I have ever had an original thought!" So, we will begin wherever we find ourselves. And our "course objective" is to end up finding ourselves again, possibly at some place new. We will have readings, watch videos, take surveys, have LOTS of discussions and do a little writing. May we all discover new ideas and new friends to share them with. To enter this course, you will need to have a gmail account. Gmail is free. If you do not already have a gmail account, you can create one by clicking on the following link: Create a gmail account. To begin the course, merely fill in your gmail address in the form below and you will receive a link to begin the course within a few days.